Meanwhile, Princess Raisa ana’Marianna runs from a forced marriage in the Fells, accompanied by her friend Amon and his triple of cadets. Now, the safest place for Raisa is Wein House, the military academy at Oden's Ford. If Raisa can pass as a regular student, Wein House will offer both sanctuary and the education Raisa needs to succeed as the next Gray Wolf queen. Everything changes when Han and Raisa’s paths cross, in this epic tale of uncertain friendships, cut-throat politics, and the irresistible power of attraction. 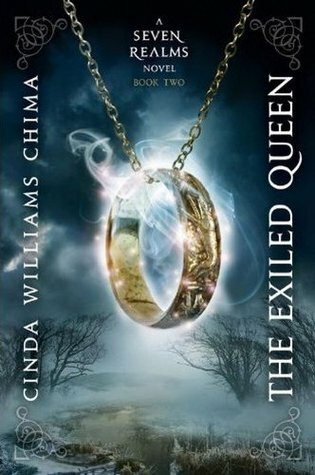 THE EXILED QUEEN is the second of four installments in author Cinda Williams Chima's Seven Realms series. THE EXILED QUEEN picks up where The Demon King left off. In case you missed it, I started this series because it takes place 20 years before her new series called Shattered Realms. Shattered Realms features the children from the lead characters of this series. Chima alternates her story between two key characters; Princess Raisa ana'Marianna and Han Alister. These two characters couldn't be more different, yet, they are both important to the future of the Queendom of the Fells. Han is a former street king who ended up quitting to help his mother and sister. Raisa is the heir apparent to the Gray Wolf Throne who has been pushed into marrying a suitable suitor in order to keep the line alive. Raisa has chosen to run away from a forced marriage that would violat the Naeming agreement with the clans and caused a war She decided to follow her friend/guard Amon Byrne to Oden's Ford. Meanwhile, Han, after losing the two most important people in his life, has been given the opportunity to travel to Oden's Ford to learn how to be a wizard now that a major surprise has been revealed. While Raisa travels with Amon and his Gray Wolf squad, Han travels with his best friend Dancer and Cat who was once one of his crew. Cat is a nice addition to the story. She's brazen, real, and ready, willing and able to play her part. This is a story that gets away from the politics of the land for just a little bit while focusing on the characters. It allows both Raisa and Han to gain knowledge that they wouldn't have learned elsewhere and also gives them a bit of backstory that they can carry forward. It also puts Raisa on a path that will eventually intermingle with Hans storyline. Han believes Raisa is Rebecca Morley, the same Rebecca that helped him in The Demon King. The one person that you can't get away from in this story no matter how hard you try, is Micah Bayar. Micah is like a festering wart that just won't go away. Micah, who has already made a play at Raisa and failed thanks to a bit of magic, must also screw with Han who has something that HE believes belongs to his family. One can't help but compare the Wizarding school in this series to Hogwarts. One can't help but compare Micah Bayar to Draco Malfoy since both families are villains. I don't claim to believe that Han is Harry, or Dancer is Ron. That's not happening. Dancer is much more knowledgeable when it comes to magic than Han. THE EXILED QUEEN adds another layer to the series. Now we see the world that has infected by wars between Kingdoms that makes any journey outside of the Fells dangerous to one's health. We also get to see a place called Aediion, a place that wizards can travel to. You could think of Aediion of a dream place where Han learns magic from a curious character named Crow. The ending of THE EXILED QUEEN will give you the creeps, and set up things for the next installment. Disney-Hyperion has the best books, I have yet to read one I didn't love. I think I need to try this one as well! Second books can really be hit or miss, so that's great you loved this one and are still really excited for the other books! Great review Shelley thanks for putting it on my radar! Micah sounds like a douchebag. This series pops up all the time on Overdrive in my recommendations. I will definitely keep it in mind. Hmm, I hadn't heard of this one before but I'm glad I now know of it since it sounds interesting. I want to read these. They sound so awesome.